A study in hypnosis, influence and the mesmeric nature of music experience, this opus is an astonishing first offering from someone who only opened Ableton three years ago. Having spent years studying psychology and music production at home in Niagara Falls, Mass Manipulation is the product of many happy accidents. Through experimenting with heavy bass samples and unusual melodies, and collaborating with emergent producers 13, Knodis and Kotek, REZZ found she had eight powerful tracks she wanted to share. I adore the eerie speech at the start of ‘Relax’ which seduces the listener into an intensely sinister but altogether alluring state of inertia as we prepare to enter this truly mind-altering body of work. 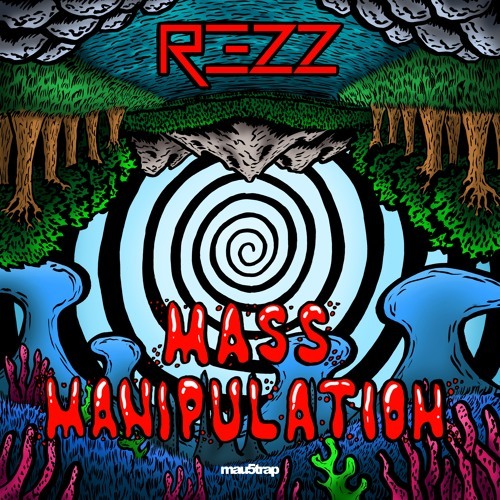 With the powerful kicks of ‘Diluted Brains’, the menacing, bass-driven ‘Premonition’, and the exotic flourishes in ‘Drugs!’, REZZ infiltrates the minds of her listeners. ‘Synaesthesia’ expounds on the dub-heavy sounds heard in the previous track, a theme that is, through the heavy, subdivided beats in ‘Livid’ and ‘Green Gusher’, manipulated slowly to bring the soundscape more within the grasps of experimental techno.With ‘Ascension’, the listener is brought rudely back to consciousness; this track is the amalgamation of everything that’s come before it, yet strangely distorted and warped, reflecting the transitional nature of hypnosis.